If you are struggling with snoring, you know how uncomfortable the condition is. We have already covered the main causes of snoring before. In this article, we look at some simple solutions that can make all the difference for your condition. Read our review of the best anti snoring sprays in the market. We have also provided a helpful buyers guide. Do Anti Snoring Sprays Work? What is the Best Snoring Spray for You? There are various factors that cause snoring. Therefore, an anti snoring spray that works for one person may not necessarily work for another. You should know the cause of your snoring before looking for a solution. Apart from this, look for a snoring spray that is meant to remedy the specific problem you have. For instance, if you snore due to overproduction of mucus, the best anti snoring spray to buy would be one designed to reduce mucus production rather than relax the uvula. Moreover, if you have excess mucus, you should avoid snoring spray solutions that contain sugars. Your snoring may also be caused by blockage of the soft palate tissues in the glottal airway. Many times, this happens due to being overweight. Sometimes, the blockage may be due to genetics. Most recommended snoring sprays are designed to tone the soft palate tissues, which make them less likely to slip into the glottal airway and vibrate. You can also use an anti snoring spray to lubricate the soft palate tissues and throat. The lubrication causes a similar effect as the tone although the working principle is different. Another benefit of snoring sprays is that they reduce inflammation. Inflamed airways are constricted and can lead to snoring. Sometimes, you may be snoring due to various causes. The good news is that the best snoring sprays address multiple problems at a go. Before buying a snoring spray, find out which issues(s) it’s supposed to address. Apart from this, check the ingredients used to make it. The ingredients are the most important things to consider when looking to buy a snoring spray. 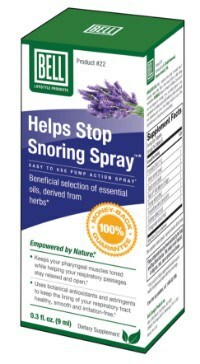 The recommended snoring spray brands now offer homeopathic or organic sprays. However, you will still come across those with various inactive ingredients you should be aware of. Below are the main ingredients of snoring sprays. You do not want to add any calories in your body before going to bed. Anti snore sprays that have sugars give you additional calories. Moreover, sugar can lead to accelerated production of mucus and hence encourage snoring. On a positive note, snoring sprays that have sugar taste sweet. So, the use of sugar in anti snore sprays is a catch-22 situation. Most snoring sprays have trace amounts of alcohol. No inebriation is caused by low levels of alcohol. While this is not usually a concern, if you are allergic to alcohol, your snoring can worsen when you use such an anti snore spray. In most cases, the throat can end up swelling. Most anti snore sprays have oils. Ideally, you want sprays that have essential oils as they are healthy. Checking for use of animal by-products in snoring sprays is important, especially if you are a vegan. On the same note, if you are suffering from celiac disease, confirm that the spray you want to buy does not contain gluten. Snoring sprays are recommended for people with light snoring problems. If you are a heavy snorer, you may need a CPAP machine. The Professnore is the best snoring spray in the market. While Professnore faces stiff competition from the Essential Health spray (read review below), it is made of all-natural ingredients, which makes it one of the best anti snore sprays. This snore spray works by lubricating the throat tissues. This helps reduce vibrations and in turn, eliminates snore noises. Made using a unique amalgam of oils, the ProfesSnore anti-snore spray (also known as Doctor Snore) has been clinically tested and proven to effectively stop snoring. Research has shown snoring sounds are substantially reduced when the throat is lubricated. While the Essential Health Stop Snoring Spray is also a recommended stop spraying solution, it has an artificial sweetener known as sucralose that gives it a more pleasant taste. The anti snore spray offers two generous ounces of spray, making it the cheapest anti snore spray. We recommend this spray for anyone looking for snoring relief as long as their snoring is not due to overproduction of mucus. The Essential Health Stop Snoring spray features a blend of essential oils that tone and lubricate the soft palate tissues. This double action approach provides relief for the most common causes of snoring. However, the artificial sweetener can lead to production of more mucus and undercut the effectiveness of the snore spray in some people. The Bell Stop also makes it on the list of the best snoring sprays. This anti snore solution uses mild, clinically tested, essential oils to provide snoring relief. The ingredients of the snore spray do not interfere with dietary restrictions. Moreover, the product has no artificial sweeteners and hence does not lead to overproduction of mucus. The major downside of Bell Stop is that it is more expensive than the other products in your stop snoring sprays review. Moreover, the solution offers 0.3 ounces, which is the smallest amount per container when compared to other products in this review. However, the Bell Stop Snoring spray has solid ingredients that help to ease snoring and improve respiration. 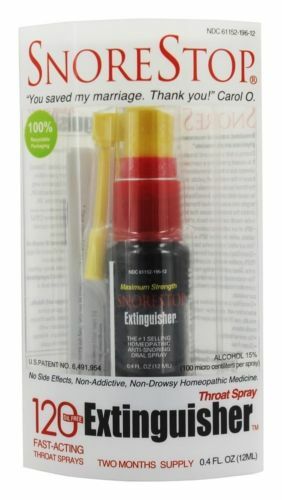 Another decent product that makes it on our stop snoring spray review is the Snorestop Extinguisher. This product is mainly recommended for people whose snoring is due to inflammation or overproduction of mucus. These two issues are known to contribute to snoring. However, many times, the issues can be resolved by a simple change of diet. Snorestop anti snoring spray offers 0.6 ounces per spray. This is the second list amount in our list of the best anti snoring sprays. The upside of Snorestop anti snore is that it is approved for use by the FDA as a homeopathic medicine. The product also has an A+ rating by the Better Business Bureau. 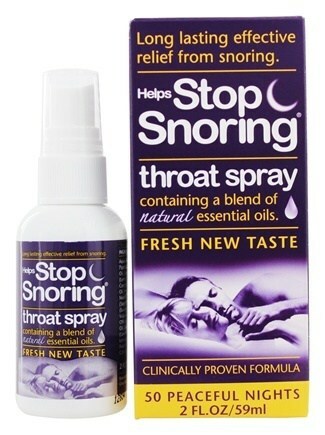 This anti-snoring spray’s excellent ability to work on the throat has been scientifically proven. The snore spray contains phosphatidy Icholine (did you just mumble through that word like I did? ), a key active ingredient that lubricates the throat muscles and consequently prevents them from any vibration and movement. The snore spray has foam properties that ensure the spray stays in place through the night. This is an anti-snoring noise and throat spray that is purely made of eye bright, a natural herb that is safe for application on both the roof of the mouth and the nose. The snoring spray is mainly effective against palatal flutter, a type of low frequency snoring that result from the soft palate vibrating due to its astringent properties. Rhynil also works as an excellent remedy for allergic rhinitis and sinuses because of its anti-inflammatory and antiseptic properties. This anti-snoring spray solution combats snoring in a different way. The spray works by breaking down mucus, a secondary cause of snoring by the fact that it blocks airways. 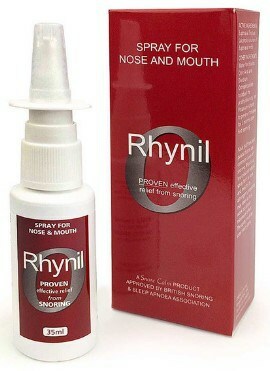 This snore spray is recommended for snorers with sinus complications or cold that has increased their mucus production. Snore Zip has a minty toothpaste-like taste. 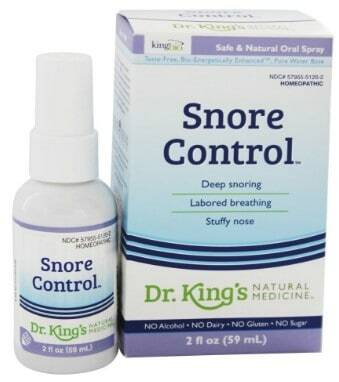 The final product on your stop snore spray reviews list is Dr. King. Like other anti snore solutions in our review, this product is made from natural ingredients that do not worsen snoring nor conflict with dietary restrictions. However, some people find the Dr. King anti snore spray a bit of a crapshoot and it works half the time. From our snoring spray review, you already know that there is no right anti snore spray for everyone. 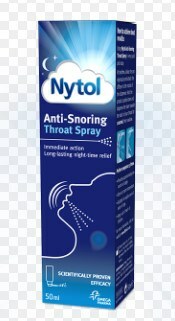 We however highly recommend the Professnore Anti Snore Oral Spray as its been known to work for most people. The lubricating effect of the anti snore spray lessens and evens stops the snoring. If your snoring is not caused by overproduction of mucus, we recommend you go with the Essential Health Stop Snoring Throat Spray as it both tones and lubricates the soft palate tissues. Apart from the above, there are other anti snore sprays that some people have had success with. We encourage you to check the reviews before buying any of the anti snore sprays. You can check an overview of the best snoring devices here.